The museum is two floors and relatively small, though with about 70 exhibits (an exhibit could be a room or one picture) that you can touch and are interactive. I took my teens, and was in good company with a variety of ages, from babies to bubbies. 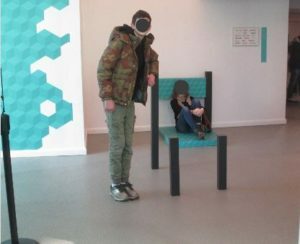 The museum has several rooms you can enter, with immersible illusions. 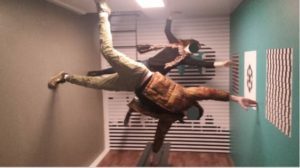 One of our favorite rooms was the tilted room, which has a tilted floor, making you feel like you’re moving, even though you can be standing still. The tilted room at the Museum of Illusions. Copyright Deborah Abrams Kaplan. They have some other fun things on the first floor like the much photographed deconstructed chair that looks like it’s a solid chair, but it is in multiple parts spaced out over the floor. Once you see it in person, it’s hard to unsee it in photos, though when I showed friends, all they saw was a chair. 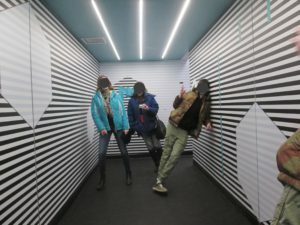 We had fun looking at the infinite ceiling and floor tunnel, and the corner where you can play 6 person cards with yourself, thanks to mirrors. 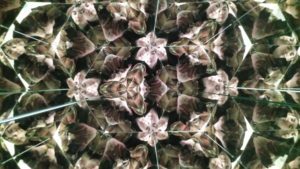 A 2-sided kaleidoscope allows you to be the subject (see above). 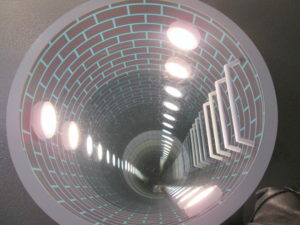 There are puzzles and wall illusions on the first floor as well as holograms. A mirrored room allows you to see yourself in infinity. Having been to the Mirror Maze at the Chicago Museum of Science and Industry, this room was not exciting. Upstairs are the most Instagrammable moments – including a room that’s sideways – it was a bit hard to figure out the best way to photograph it! 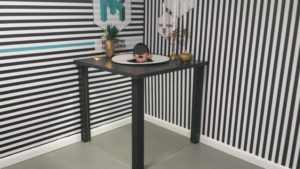 There’s also a fun room where you serve your head on a platter. The museum was fun for us, and seemed more like an extended exhibit than an entire museum. But it was done well. Where: The Museum of Illusions is at 77 8th Avenue (at 14th). Their hours are extensive, from 9 a.m. to 10 p.m. every day (check hours to be sure before going). Try to go at an off time, like first thing in the morning, before it gets crowded. Tickets: Tickets are $19/adult, $17/student (14-22), $15/child (6-13) and $53/family (2 adults, 2 kids). 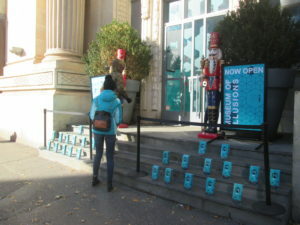 How long will I spend at the Museum of Illusions: The museum website says you’ll spend 1-2 hours there. That’s probably about right. We spent 45 minutes walking through, taking our time, and another 15-30 minutes playing with the wooden puzzles in the gift shop (they have some upstairs in the gallery too). It’s not a large museum. Disclosure: The museum provided us with tickets in order to write this review Museum of Illusions in New York City. All opinions are my own. Previous PostPrevious Review: Is The Lifespan of a Fact Appropriate for Kids? Next PostNext Review: Is the Prom Appropriate for Kids?